Mizmor LeDavid is a neighborhood Orthodox Zionist shul which strives to create an inviting, warm environment and spirited, serious participatory prayer. Our diverse multi-generational, multi-lingual community encourages lively approaches to spiritual, cultural and intellectual diversity and support of the local community. Mizmor LeDavid realizes its vision through focused intentional davening in Nusach Sfard (Chasidic and Carlebach style), including the addition of new melodies and joyful dance, as well as critical thinking through regular divrai torah, shirim, guest lectures, shabatonim and cultural events. Mizmor LeDavid strives to be sensitive to gender issues and other needs of community members within the framework of Halacha through study and innovation. The Kehilla embraces religious and ethnic diversity within a friendly, relaxed ambience, where serious, spiritual davening is combined with social interaction. 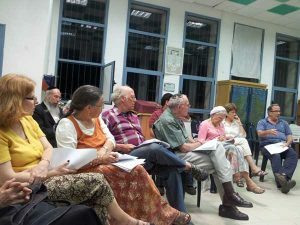 Through its learning programs and tzedakah and tikun olam work with indigent elderly, welcoming converting soldiers and visitors of other religions into their homes, Mizmor LeDavid fulfills its mission to reach out to the broader community. Mizmor LeDavid (Hymn to David) is a congregation of about 75 families and individuals, most of whom live in the Talpiot and Baka neighborhoods of Jerusalem. Many are from the US and Canada, and we also have members from Germany, Hong Kong, Spain, Holland, Belgium, France, Argentina, Brazil, England, South Africa, and, of course, Israel. Mizmor LeDavid is named in memory of David Margolis, a friend and a powerfully iconoclastic journalist and novelist. As an editor at the Los Angeles Jewish Journal and the Jerusalem Report and in his novels he used his fine eye for detail and his ear for language to craft subtle and complex challenges to the status quo. We remember and miss him. Since 2006 Mizmor has shared Beit Payis with Lahavot, of the Religious Scouts. Our building seats 150 people—though we often have 200+ on Friday nights, many of whom are standing outside. The building has high ceilings, and 12 floor to ceiling windows. Before that, we met for 1 ½ years in the offices of Kef International, which arranges aliya relocations. Mizmor came together from a shared commitment to focused, intentional prayer, warm welcome, Torah study, and near continual singing. Mizmor LeDavid is committed to Torah learning. There are short divrei Torah in Hebrew every Friday night, and longer ones in English, usually with extensive discussion, after Kiddush on Shabbat day. There are two Parshat classes Shabbat afternoon, one given by Diane Bloomfield or Dov Leiman, and a Seudat Shlishit with Rav Kook hosted by Rav Chaim and Mindy Kornberg. Rav Mordechai Goldberg, Drew Tick, and Arieh Rottenberg are often shalicheh tzibur, and Rav Chaim Kornberg or Rav Mordechai usually give the drash on Erev Shabbat. Both Rav Kornberg and Rav Goldberg have Smicha from Rav Riskin in Efrat. Rav Goldberg was assistant Head Rabbi of Poland, the Rav of Malmo, Sweden, and has been acting Rav in various cities in the FSU. Rav Kornberg has taught Torah at Brovenders Yeshiva, Rapapport School, Yakar, Torat Chaim in Pisgat Zaev, and is the director of the Yakar Polish Educators Program, which does weekly distance learning with educators in Poland, and brings them to Israel for 10 days every year for intensive study. Mizmor LeDavid has no political agenda and though we have political ideas spanning a wide spectrum, they are rarely discussed in formal shul settings. Mizmor holds benefit concerts, many featuring members performing. The charity fund of Mizmor is Keren Doris L’Kashish V’Nizkak , The Doris Fund for the Aged and Needy. Helen Taitz, an experienced social worker, founded and administrates Keren Doris in memory of her mother, Doris Bornstein-Moschytz z”l. Doris was a ba’alat chesed, who devoted herself with sensitivity and love to the Jewish elderly in Zurich, many of them Holocaust survivors. Keren Doris provides financial aid to the elderly and impoverished who are chronically ill. These people, many of who are holocaust survivors, struggle to cover basic needs and have little left over for medications, hearing aids, eyeglasses, and dentures. Keren Doris has the backing of Rav Yehoshua Zemel, Rav Chaim Kornberg, and Rav Mordechai Goldberg. 90% of donations on behalf of Keren Doris go to directly to the needy; 10% goes to Mizmor for administration. Mizmor LeDavid is located at the corner of Rehov Efrata, Giladi, and Nachum Shadmi in Old Talpiot. We daven Nusach Sfard with Chasidic and Shlomo Carlebach style. Ke’hillat Mizmor Le’David is a registered not-for- profit organization (amuta). For further information, please email mizmorledavid@gmail.com or call Neil Kummer, 972-2-673-5043 or, from North America, 1-866-425-5224, ext. 101.